In celebration of the annual American Library Association Convention being held this month in New Orleans, we asked ArchNewsNow contributor Kenneth Caldwell to interview two leading architects on library design trends. 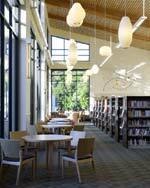 Mark Schatz, AIA, a principal with Field Paoli, is well known in the San Francisco Bay Area for his community centers and public libraries. Schatz discusses combining those building types and the public process that is required to get there. Ed Dean, AIA, LEED, recently joined San Francisco-based Chong Partners as a project director working on academic and large public libraries. Dean offers some observations about combining these uses. Interestingly enough, both architects talk about the renewed roles that all kinds of libraries have to play in our civic life. Kenneth Caldwell: We want to talk to you about recent changes in public libraries, especially smaller community libraries. Besides the obvious issue of technology, what’s changing? Mark Schatz: One trend we are seeing more of is the multi-use building. 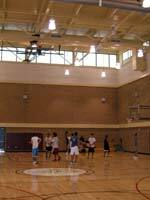 The library, senior center, teen center, gym, all together. KC: Is this something communities are demanding? Or is it mostly an issue of keeping construction and operations costs down? Schatz: I think it’s a matter of synergy more than budget. For years architects worked with this concept, which seemed rooted in the 1950s, that you had a city plan that gave each use its own discrete area. And you would drive from home to business to retail to school to library. That’s not the tradition of cities prior to that period. Residences and offices were over the shops; uses and people commingled. You could get most of what you needed within a short distance. Architects and urban designers are finding ways to change various codes and ordinances to encourage mixed use, and one area we are seeing that effort is with community facilities. It’s part of a significant, larger trend. Schatz: There are logistics in any project. Hours of operation is a big one. If the library is open late but the community center is not, how do you close off one but not the other? Computer systems for a library are quite different from those in a community center. Actually, gym odors are not the big problem, pool chlorine is. If somebody is having a wedding in the banquet hall of a community center, you don’t want them smelling the pool. You have to keep them far enough apart and have good ventilation. But there is some interaction and that’s OK; that’s just the energy of the place. KC: How are libraries and uses like retail combining? Schatz: We are seeing it work both ways; retail concepts within libraries and libraries within retail centers. 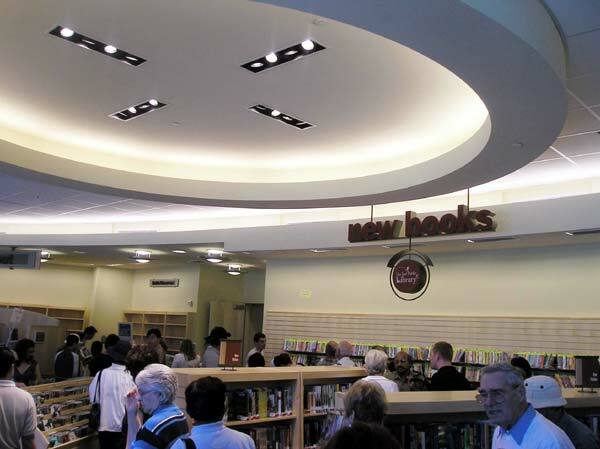 I’ve designed branch libraries that were built within existing shopping centers. Field Paoli designed a master plan for an area in Rancho Cucamonga, California, called Victoria Gardens that includes a theater and library along with a large retail element. Within libraries, we’ve been incorporating retail ideas or elements. Librarians looked at Barnes & Noble and figured it out. We have a modest café in a library we just finished in San Jose and a full service café in the new Belmont Public Library. KC: What are some other retail strategies? Schatz: Like retail, libraries work in layers. There are people who just drop in and there are people who stay a long time and use the resources with some depth. We started designing these areas called marketplaces near the front door. You can, if you will, impulse shop and see the new books, the best sellers, videos, DVDs, and CDs. The use of media collections has gone way up in the last several years. When you come in the door you’ve got a lot of popular materials right there so you can run in, pick them up, check out, and leave. Over time, we hope people stay longer and longer. KC: What about storytelling areas? How do they fit in this retail model? Schatz: They are getting more innovative and offering programs for really young kids. Now they have spaces for infants where parents can bring them in for tactile learning before they can even listen to a story. The children’s areas are much more fun and emphasize storytelling, not just book reading. They are more comfortable than before, not just an area with chairs, but carpeted steps with murals. What’s really changed from when we were kids is that libraries are no longer quiet places. We always design quiet zones, but the buildings are buzzing. KC: I still want the quiet rooms. Schatz: Of course, but now those are like the draw in a retail setting. We create a target zone at the end of each program area. So, at the end of the area for adults doing research might be a room with a fireplace, periodicals, newspapers, and comfy chairs. You move beyond that marketplace zone through a research zone and get to the cozy lounge. At the Millbrae library I’ve never seen an empty chair. The storytelling zone might be at the end of the children’s wing so kids see all the resources on their way to a programmed activity. The order of the activities and the vistas are influenced by retail strategies. KC: There seems to be a renewed interest in public libraries. How has that changed the process of designing these buildings? Schatz: Public participation. You could say it’s always designed by a committee. KC: Is the public always involved at every step of the way? Schatz: We always get input from members of the community, members of the city staff, members of the council, or a combination thereof. I've worked with committees as large as 23 people where we've met every other week with the task force. In other communities we’ve worked with just a few staff members, but then we go out and lead the large community design charrette. What is important with committees is first making sure that you have a truly representative committee and convincing them to hang their special interest hats at the door. KC: What do you mean special interest? Schatz: It can be difficult to get people off their own soapbox. Maybe the guy who represents Little League baseball only wants to talk about the ball field and addresses every issue from the perspective of the ball field. But there are usually members of the community who are more open minded and can see the big picture. They are key. Trying to get people to see the big picture is really important. It is also important that you go back to subsequent community meetings and show that you heard what they said, you looked at it, and you studied it. The comments from the last meeting are the introduction to the next meeting. KC: But how do you keep all these interests on track? Schatz: At the outset you talk about a mission statement and three or four goals. When things get off track, you remind everybody what the over-riding goals are. KC: So, that's kind of the touchstone. Schatz: Yes, you ask the question: how does that decision help us achieve the goals that we've set out, that we agreed to at the beginning? But you also need a strong committee chair or strong staff person who represents the client. KC: What about aesthetic issues? The public seems more interested in architecture and design than before. How do you deal with that? Schatz: I like to do this exercise where I ask people to close their eyes, walk in the front door of the building, and then tell me three words that describe the experience they've had. People begin seeing their building on an emotional level, rather than relying on words like “modern” or “neo-classical building.” We use images of building to help give them a language they are comfortable with. People are more sophisticated about furnishings and interior spaces, but not many people are that confident about the architecture unless they are design professionals themselves. And you certainly get those folks at all your meetings. They come in with drawings and models. Schatz: Oh, yes. We had a local architect come in with a scale model of what he thought the building should be. In another project we got a 30-page fax from one of the architects. We listen to everybody; you never know where a great idea might come from. People want to understand what the building is going to look like from the street and from the entry. We still like to build large-scale models of the entry sequence so individuals can stick their head in and get a sense of what the space will be. KC: Give us an example of how the public helped shape a building’s architecture. Schatz: In the Almaden neighborhood in San Jose, we were working with a site where there had been an outdated community center. The community wanted to preserve the existing trees, including a stand of very handsome redwoods. So we designed a 65,000-square-foot building, along with twice the parking they had previously, around these trees. We ended up with a kind of lobster-shaped building with its claws reaching around this redwood grove. What was difficult was not the form so much as the foundation system and paving selection. But the trees survived and are the heart of the outdoor room, which is important in a temperate climate like San Jose. It is not only important what a building looks like from the street, but what happens after you are in the front door. So here, as soon as you walk through the front door, you can see the view to the courtyard with these stunning old redwoods and beyond that to the library. We wanted this transparency to give you a better understanding of the entire complex. 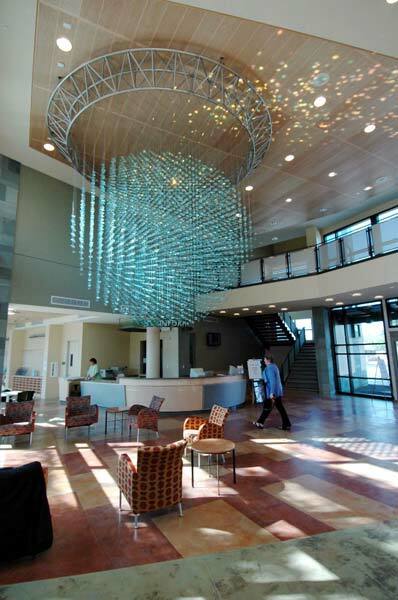 This central architectural idea grew out of our working with the community. KC: Looking ahead, what do you see? Schatz: As a result of the increased participation, there is more a sense of ownership. I think this interest in public facilities like libraries and community centers is, at least in part, a reaction against isolation, against people holing up at home with their technology. What is encouraging about the mix of uses is that we are going back to this notion of a village. That’s good news for libraries and for society in general. Kenneth Caldwell: What trends do you see today in the design of large urban libraries? Ed Dean: Libraries are becoming a kind of public forum. They are one of the last places where people can intersect, get public service, and shop for information. They’re becoming less about checking out a book and more about finding services and interacting. There are homework centers, computer training centers. I reviewed the plans for a new library in San Bernardino, California – it hasn’t been built yet, but a prominent feature in the design is a community garden that occupies the entire roof. The biggest change I’ve seen is the addition of computers for children – a lot of larger libraries now have arrangements with the school district to provide a high-tech classroom. The districts don’t tend to have the resources. 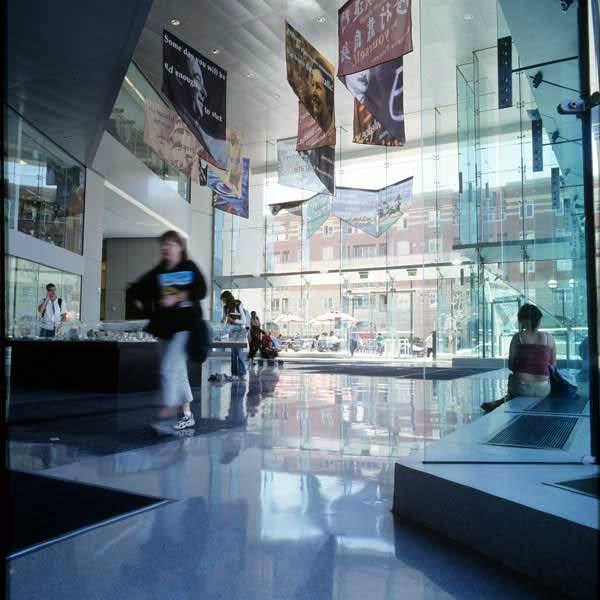 KC: What are you seeing in terms of sustainable design and public libraries? Dean: They all want it. They don’t want to spend a lot on maintenance, and they don’t want to have a big electric bill. Daylighting saves energy and creates the mood you want. Improving indoor air quality is something that we usually bring up – there’s less awareness of that. Actually, natural ventilation works better in a library than in an office building. People come and go in a library more than they do in a workplace, so you don’t need to offer precise, individually adjusted temperature control. KC: Let’s talk about the integration of academic and public libraries, as in San Jose’s new main library. What works, what doesn’t work? Dean: The two kinds of librarians, public and academic, are very different from each other. They don’t even usually attend the same conferences. I’ve been told that public librarians are much more interested in giving direct assistance, getting the information for the patron; academic librarians are more like consultants, they tell patrons where to look. It’s a different tradition of service. You can imagine what this means at the reference desk, when both types of librarians are assisting both types of patrons. The San Jose library was definitely a big experiment. The public and academic librarians have shared reference desks, but the patrons don’t know who is who. The public just wants to find books, while students are likely to be looking for a room where they can meet and talk about assignments. Ten years ago, with the advent of the computer, libraries were designed with an array of tables and computers, and patrons were focused on their own projects or on writing e-mail. Now, group learning spaces are in demand. Sure, some of them are still checking their e-mail, but you can take your laptop to Starbucks for that. What the students want to do in the library is sit together with their laptops and talk – and then Google something as a team. There are more audiovisual rooms where you can call things up on a big screen. Modern academic libraries are essentially becoming a large computer that the students can interact with. It’s a lot noisier. It's like Grand Central Station. KC: Is there a lot of talk among your clients about designing spaces so they can be changed to accommodate new technologies, the way laboratory buildings and engineering buildings are being designed? Dean: Yes, we talk about it often. Technology has an impact way beyond what anyone expected, and I think librarians understand that. The building’s going to be there for at least 50 years, probably 100 years. And technology is changing every three years. KC: What, then, do you think is architecture that might reflect this ideal of the contemporary academic library, this brave new world? Dean: I think you have a certain freedom. First of all, do you want to create a symbol or do you want to respond to the context? You could imagine a beautiful contextual thing that could actually fit in the context of Stanford or UC Riverside. And you could do it well. It wouldn’t necessarily have to symbolize the future of the library or the impact of technology. You can say “brave new world,” if that’s what you want. You could do a big box, you could do something with titanium, you can do all that stuff. KC: Does that give you too much freedom? Is it like being a kid in a candy store? Dean: I feel the same way as my mentor, Joseph Esherick: show me the context. If you have the specific program and setting, then the building almost forms itself from the inside out, in a way. KC: Tell us about some of your past experiences working with Esherick Homsey Dodge and Davis [EHDD]? What projects were the most memorable? 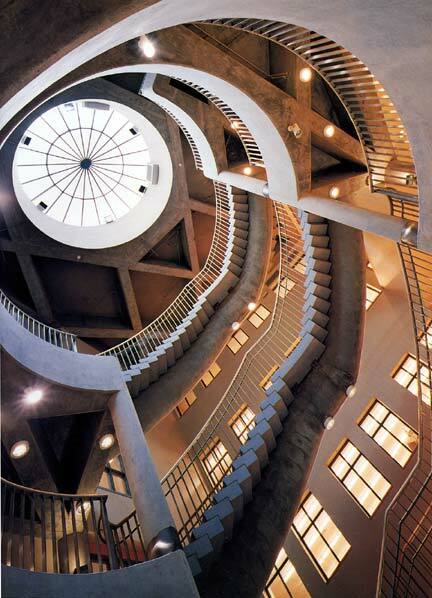 Dean: We created an unusual building at the University of California, Berkeley. It was an underground addition connecting Doe Library, a beaux arts building from 1912, and Moffitt Library, a Modernist concrete structure from the 1960s. There, the issues were all about light and place and the way people feel when they’re reading. And respecting the historic building while doing something that’s still strong. The campus wanted it to be invisible, or as invisible as possible. I also worked on the Flora Lamson Hewlett Library for the Graduate Theological Union library in Berkeley. Louis Kahn designed it initially, before he died. Then Esherick was asked to complete it, retaining as much as possible of the Kahn design. You can see the styles of both architects in this building. It was certainly an honor to be asked to devise an approach for an addition to a building with such a history. We inserted an audiovisual training room right at the atrium, which we had to do in a very sensitive way so we didn’t lose any of the views through the building. The room has hardly any visual impact at all. I love the idea that you’re working with something existing – you’re making it better or supporting the original. It is a kind of sustainable attitude. Somehow you’ve managed to touch it lightly, but you’ve got something that maybe the original architect intended. 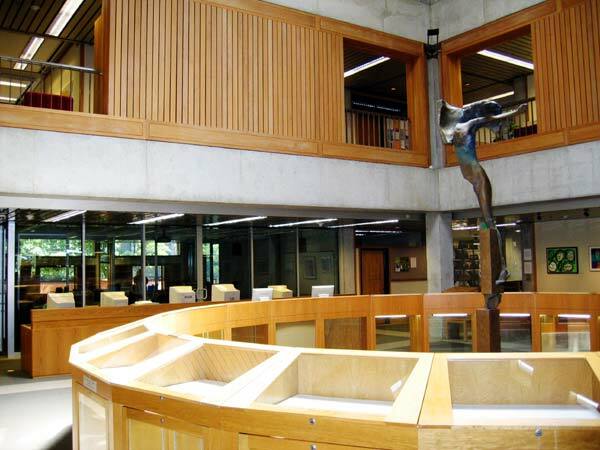 The most fascinating and intriguing challenges with library design are either working with buildings that are quite good, so the effort is about respecting the original design, or working with more Brutalist buildings. A lot of campus library work in California is all about de-brutalization, because so many of these buildings were done in the 1960s and 70s, and they are rigid, repetitive buildings. 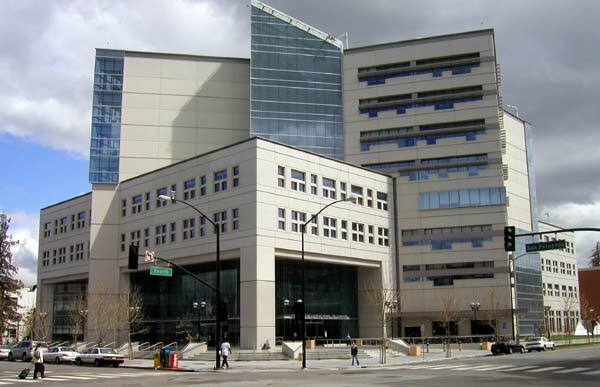 KC: Even with a Brutalist building, you may end up doing a lot to make it look like it was renovated with a light touch. Dean: People have no idea how much you have to do to make it look like you didn’t do anything. Kenneth Caldwell is a communications consultant and writer based in San Francisco. 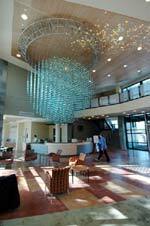 Field Paoli: Almaden Library & Community Center, San Jose: The new lobby features a custom glass sphere by artist Ray King. 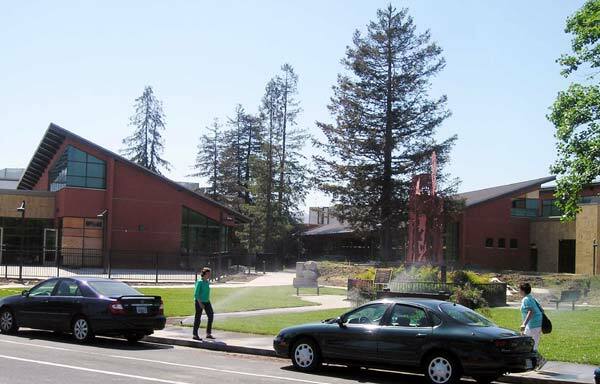 Field Paoli: Almaden Library: Community input led to saving a stand of redwood trees. Field Paoli: Almaden Library: “Marketplace” displays put popular items close to the front entry for quick checkout. 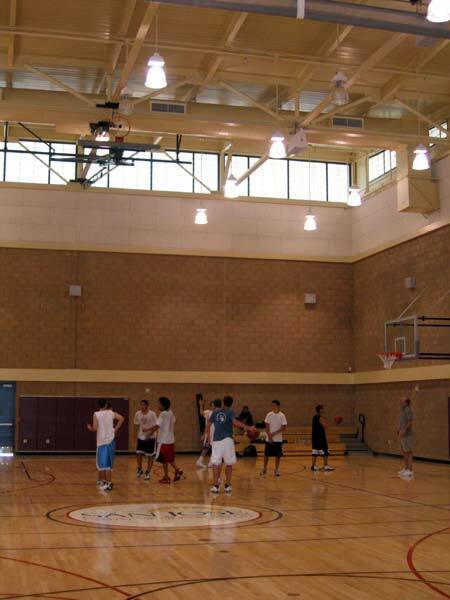 Field Paoli: Almaden Library: Placing the gymnasium at the opposite end of the complex from the library encourages movement between program spaces and isolates noise. 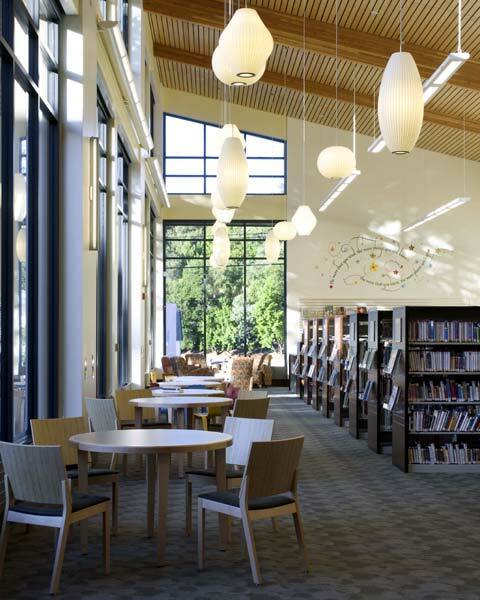 Field Paoli: Almaden Library floor plan illustrates the “lobster claw”-shaped wings wrapping around the redwood grove. Field Paoli: Belmont Library: Borrowing a strategy common in retail, libraries are placing the quiet zones and other destinations at the end of vistas to draw visitors through the facility. 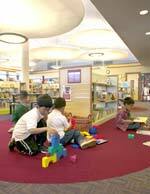 Field Paoli: Millbrae Library: Kids’ areas are more than reading corners; they are destinations. 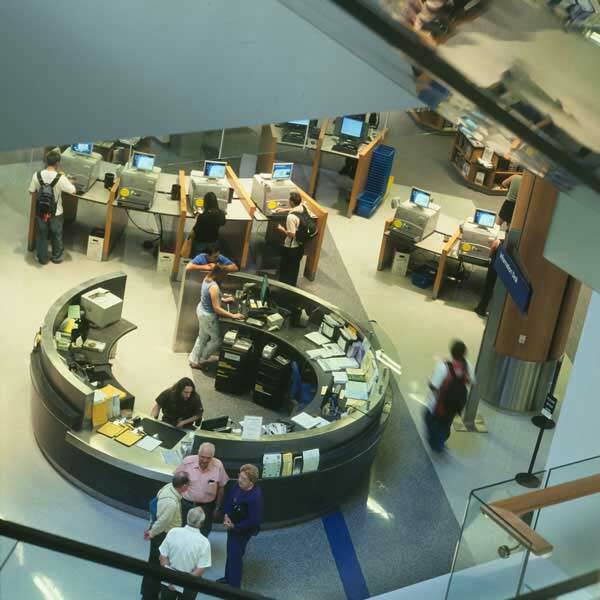 The King Library information desk is shared by public and academic librarians. 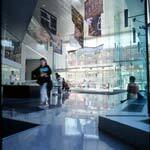 EHDD: The new Doe Library on UC Berkeley’s campus went underground to protect a historic building and open space. EHDD: The new Flora Lamson Hewlett Library at the Graduate Theological Union, Berkeley, California, was based on an early concept by Louis Kahn; the completed building and subsequent renovations have been intentionally subtle.